For the footballer, see Stanislav Petrov (footballer). This name uses Eastern Slavic naming customs; the patronymic is Yevgrafovich and the family name is Petrov. Petrov was born on 7 September 1939 near Vladivostok. His father, Yevgraf, flew fighter aircraft during World War II. His mother was a nurse. Petrov enrolled at the Kiev Higher Engineering Radio-Technical College of the Soviet Air Forces, and after graduating in 1972 he joined the Soviet Air Defence Forces. In the early 1970s, he was assigned to the organization that oversaw the new early warning system intended to detect ballistic missile attacks from NATO countries. Petrov was married to Raisa, and had a son, Dmitri, and a daughter, Yelena. His wife died of cancer in 1997. According to the Permanent Mission of the Russian Federation to the UN – on 19 January 2006, over 22 years after the incident – nuclear retaliation requires that multiple sources confirm an attack. In any case, the incident exposed a serious flaw in the Soviet early warning system. Petrov has said that he was neither rewarded nor punished for his actions. Had Petrov reported incoming American missiles, his superiors might have launched an assault against the United States, precipitating a corresponding nuclear response from the United States. Petrov declared the system's indication a false alarm. Later, it was apparent that he was right: no missiles were approaching and the computer detection system was malfunctioning. It was subsequently determined that the false alarm had been created by a rare alignment of sunlight on high-altitude clouds above North Dakota and the Molniya orbits of the satellites, an error later corrected by cross-referencing a geostationary satellite. Petrov later indicated that the influences on his decision included that he was informed a U.S. strike would be all-out, so five missiles seemed an illogical start; that the launch detection system was new and, in his view, not yet wholly trustworthy; that the message passed through 30 layers of verification too quickly; and that ground radar failed to pick up corroborative evidence, even after minutes of delay. However, in a 2013 interview, Petrov said at the time he was never sure that the alarm was erroneous. He felt that his civilian training helped him make the right decision. He said that his colleagues were all professional soldiers with purely military training and, following instructions, would have reported a missile launch if they had been on his shift. Petrov underwent intense questioning by his superiors about his judgment. Initially, he was praised for his decision. General Yury Votintsev, then commander of the Soviet Air Defense's Missile Defense Units, who was the first to hear Petrov's report of the incident (and the first to reveal it to the public in the 1990s), states that Petrov's "correct actions" were "duly noted". Petrov himself states he was initially praised by Votintsev and promised a reward, but recalls that he was also reprimanded for improper filing of paperwork because he had not described the incident in the war diary. He received no reward. According to Petrov, this was because the incident and other bugs found in the missile detection system embarrassed his superiors and the influential scientists who were responsible for it, so that if he had been officially rewarded, they would have had to be punished. He was reassigned to a less sensitive post, took early retirement (although he emphasized that he was not "forced out" of the army, as is sometimes claimed by Western sources), and suffered a nervous breakdown. In a later interview, Petrov stated that the famous red button was never made operational, as military psychologists did not want to put the decision about a nuclear war into the hands of one single person. The incident became known publicly in 1998 upon the publication of Votintsev's memoirs. Widespread media reports since then have increased public awareness of Petrov's actions. There is some confusion as to precisely what Petrov's military role was in this incident. Petrov, as an individual, was not in a position where he could single-handedly have launched any of the Soviet missile arsenal. His sole duty was to monitor satellite surveillance equipment and report missile attack warnings up the chain of command; top Soviet leadership would have decided whether to launch a retaliatory attack against the West. But Petrov's role was crucial in providing information to make that decision. According to Bruce Blair, a Cold War nuclear strategies expert and nuclear disarmament advocate, formerly with the Center for Defense Information, "The top leadership, given only a couple of minutes to decide, told that an attack had been launched, would make a decision to retaliate." Petrov later said "I had obviously never imagined that I would ever face that situation. It was the first and, as far as I know, also the last time that such a thing had happened, except for simulated practice scenarios." In the aftermath of the incident, the Soviet government investigated the incident and determined that Petrov had insufficiently documented his actions during the crisis. He explained it as "Because I had a phone in one hand and the intercom in the other, and I don’t have a third hand"; nevertheless, Petrov received a reprimand. In 1984, Petrov left the military and got a job at the research institute that had developed the Soviet Union's early warning system. He later retired after his wife was diagnosed with cancer so he could care for her. A BBC report in 1998 stated Petrov had suffered a mental breakdown and quoted Petrov as saying, "I was made a scapegoat." Petrov died on 19 May 2017 from hypostatic pneumonia, though it was not widely reported until September. On 21 May 2004, the San Francisco-based Association of World Citizens gave Petrov its World Citizen Award along with a trophy and $1,000 "in recognition of the part he played in averting a catastrophe." In January 2006, Petrov travelled to the United States where he was honored in a meeting at the United Nations in New York City. There the Association of World Citizens presented Petrov with a second special World Citizen Award. The next day, Petrov met American journalist Walter Cronkite at his CBS office in New York City. That interview, in addition to other highlights of Petrov's trip to the United States, was filmed for The Man Who Saved the World, a narrative feature and documentary film, directed by Peter Anthony of Denmark. It premiered in October 2014 at the Woodstock Film Festival in Woodstock, New York, winning "Honorable Mention: Audience Award Winner for Best Narrative Feature" and "Honorable Mention: James Lyons Award for Best Editing of a Narrative Feature." For his actions in averting a potential nuclear war in 1983, Petrov was awarded the Dresden Peace Prize in Dresden, Germany, on 17 February 2013. The award included €25,000. On 24 February 2012, he was given the 2011 German Media Award, presented to him at a ceremony in Baden-Baden, Germany. Petrov said he did not know whether he should have regarded himself as a hero for what he did that day. In an interview for the film The Man Who Saved the World, Petrov says, "All that happened didn't matter to me—it was my job. I was simply doing my job, and I was the right person at the right time, that's all. My late wife for 10 years knew nothing about it. 'So what did you do?' she asked me. 'Nothing. I did nothing.'" ^ a b c d e f "The Man Who Saved the World Finally Recognized". Association of World Citizens. Archived from the original on 21 July 2011. Retrieved 7 June 2007. ^ Long, Tony (26 September 2007). "The Man Who Saved the World by Doing ... Nothing". Wired. Retrieved 1 December 2011. ^ a b c d e f Chan, Sewell (18 September 2017). "Stanislav Petrov, Soviet Officer Who Helped Avert Nuclear War, Is Dead at 77". The New York Times. Retrieved 18 September 2017. ^ "Смерть предотвратившего ядерную войну офицера Петрова подтвердили" (in Russian). Lenta.Ru. 19 September 2017. 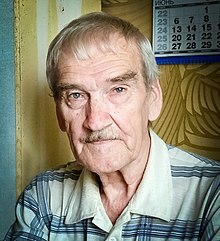 ^ "Stanislav Petrov - the man who quietly saved the world - has died aged 77". Metro. 18 September 2017. Retrieved 19 September 2017. ^ a b "On Presentation of the World Citizens Award to Stanislav Petrov" (PDF) (Press release). Permanent Mission of the Russian Federation to the United Nations. 19 January 2006. ^ "Midnight and Counting". The Economist. Retrieved 30 September 2017. ^ Hoffman, David (10 February 1999). "I Had A Funny Feeling in My Gut". The Washington Post. ^ "Der rote Knopf hat nie funktioniert". Frankfurter Allgemeine Zeitung (in German). 18 February 2013. ^ "Stanislav Petrov obituary". The Guardian. 11 October 2017. ^ a b c d e "Important Insight". Bright Star Sound. It is nice of them to consider me a hero. I don't know that I am. Since I am the only one in this country who has found himself in this situation, it is difficult to know if others would have acted differently. ^ "War Games". Burrelle's Information Services (Dateline NBC), 12 November 2000. ^ Little, Allan (21 October 1998). "How I Stopped Nuclear War". BBC News. Retrieved 11 November 2017. ^ "Stanislav Petrov, 'The Man Who Saved The World,' Dies At 77". NPR. Retrieved 19 September 2017. ^ "'I was just doing my job': Soviet officer who averted nuclear war dies at age 77". RT. 17 September 2017. Retrieved 17 September 2017. ^ "Stanislav Petrov, who averted possible nuclear war, dies at 77". BBC. 19 September 2017. Retrieved 19 September 2017. ^ a b c "Stanislav Petrov Averts a Worldwide Nuclear War". Bright Star Sound. Retrieved 27 September 2006. ^ a b "Soviet officer who 'saved the world from WWIII' gets Dresden Peace Prize". RT. 18 February 2013. Retrieved 17 January 2018. ^ "Statement Film website". Statement Film ApS. ^ Bernstein, Rachel (21 October 2014). "2014 Woodstock Film Festival Honors Darren Aronofsky, Ann". Indiewire. ^ "Preisträger – Dresden-Preis (Prize winners - Dresden Prize)". Internationaler Friedenspreis (in German). Retrieved 28 September 2018. ^ "Deutscher Medienpreis 2011 an Dr. Sakena Yacoobi, Dr. Mitri Raheb, Stanislaw Petrow & Dr. Denis Mukwege". Deutscher Medienpreis (in German). Retrieved 28 September 2018. ^ "The Nuclear War that Almost Happened in 1983". The Baltimore Sun. Wikimedia Commons has media related to Stanislav Petrov. This page was last edited on 20 April 2019, at 17:23 (UTC).